Most of the public debate over natural gas extraction in the Marcellus Shale regions of Pennsylvania and New York so far has focused on hydrofracturing (fracking)--the technique used to extract the gas--and its potential impact on drinking water. The debate is likely to widen in the the fall when legislators in Pennsylvania start to deal with the more than 90 recommendations in the final July 12, 2011 report of Gov. Tom Corbett's Marcellus Shale Advisory Commission. That's because the report not only addresses environmental and public health issues but also job training, market development, infrastructure and local impacts. One of the areas likely to create environmental news headlines involves basic industry infrastructure, namely, the processing plants, compressor stations and pipelines needed to move the gas from the drilling wells to homes, schools and businesses across the northeast. In a recent Alert to its clients, the law firm of Saul Ewing focused on pipeline recommendations. Attorney Elizabeth U. Witmer wrote the summary below. 1. 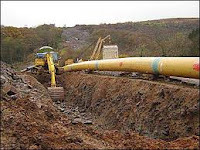 A lead state agency should be designated to alleviate delays in linear pipeline project development and approval; to identify redundant natural and cultural resource reviews which should be eliminated; "to properly tailor scope of agency reviews"; and the PA Natural Resource Inventory on-line tool be expanded and used for projects greater than 15,000 feet. 2. State agencies should offer accelerated permit reviews with guaranteed time frames, with extra fees to be paid by applicant. 3. PennDOT should add language to Excess Maintenance Agreements directing industry to evaluate E&S controls already in place on affected roadways and to determine what should be in place before road reconstructed. · "provide sufficient authority and resources for appropriate government agencies to ensure that ecological and natural resource data are using in the review and siting of proposed pipelines, in order to avoid or minimize impacts to these resources." 5. Future leasing of state forest land should be limited to agreements which result in no or minimal surface impact - this is directed more at drilling leases, but could result in more requests for drilling on state forest land for pipelines too. 6. "The Commonwealth should incentivize the development of intra-state natural gas pipelines to ensure the in-state use of Marcellus Shale and to lower costs to consumers through the avoidance of interstate pipeline transmission costs." 7. State should work with the federal Pipeline and Hazardous Materials Safety Administration to locate a safety inspector facility in PA.
8. A specific recommendation that the PUC be given "statutory gas safety oversight of non-jurisdictional intra-state gathering systems, including mechanisms to establish safety standards regarding the design, construction and installation of such lines within Class 1 areas" but with language that the PUC's jurisdiction should not extend beyond safety. 9. PUC regulated pipelines should report the country of origin and manufacture of any steel products to the PUC, to ensure the safety, integrity and use of high quality steel, such as steel which meets API standards. The Commission itself cannot effect change, but these recommendations will influence legislative and regulatory changes in the near term. Trying to stop raw sewage flow and it's 103 degrees!